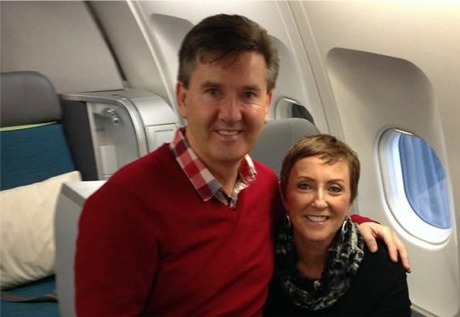 VOYAGERS Daniel and Majella O'Donnell are "bobbing along" on the high seas and won't touch dry land until tomorrow. But the couple, who began a four-month world cruise in Los Angeles last week, have already found their sea legs and are enjoying the facilities aboard their luxury liner. "Still bobbing along. Won't touch land until Tuesday but there is loads to do. We're living it," Majella (55) tweeted. Daniel and Majella on the plane en route to their dream cruise. She also offered her congratulations to Daniel's Strictly Come Dancing co-star Kristina Rihanoff who announced her pregnancy on Celebrity Big Brother last week. "Absolutely delighted to hear that @KRihanoff and @RugbyBenCohen are expecting a baby! You will be a wonderful mum Kristina," added Majella. The O'Donnells decided to go on a long cruise when Majella was undergoing treatment for breast cancer including a double mastectomy in 2014. The couple finally departed on their trip-of-a-lifetime after spending the summer filming their B&B travel series following which Daniel concluded a four-week stint on the hit BBC dance show. "After such a busy year we are both so looking forward to spending some time together with nothing to do," Daniel told fans. Meanwhile, the first of the country star's comeback shows are already sold out with 20,000 fans to descend on Killarney, Co Kerry, for his five-night run in August.